Tiffin Metal Products is a 50 year old manufacturing company that makes the highest quality museum storage cabinets. Designs can be sketches, computer generated, your choice, but must cover the front of the cabinet. Top, sides, back, & inside drawers are optional. All designs must be submitted as a pdf or jpg to lgottfried@tiffinmetal.com by December 13, 2013. The Winner will be chosen before Christmas and that cabinet must be completed by April 15th. Please go to http://www.CEcollaborative.org to register and sign contest waiver. 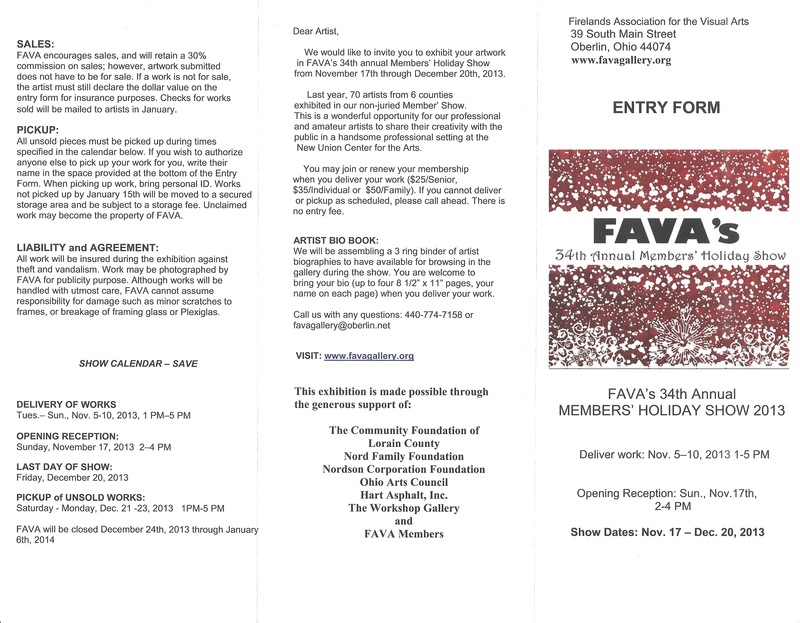 Firelands Association for the Visual Arts in Oberlin is having their 34 Holiday show! 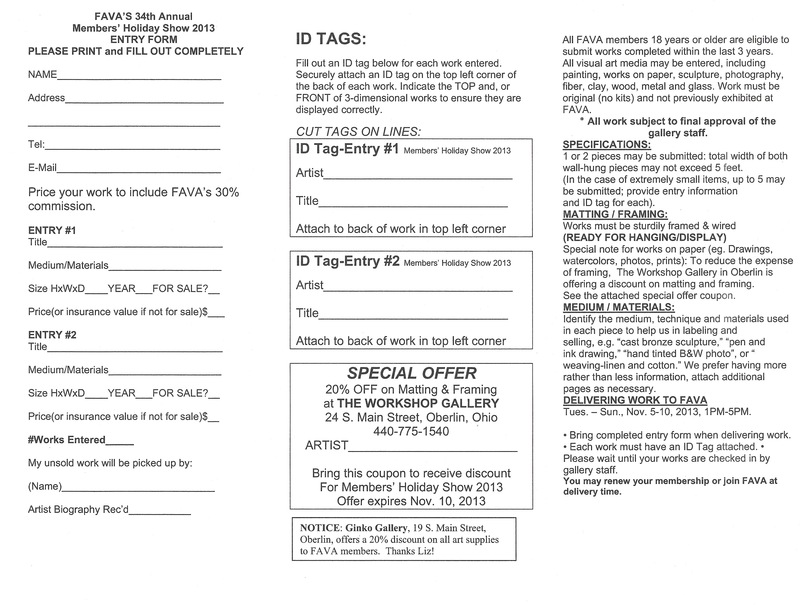 Deadline for delivery is Nov. 5-10, and opening reception is Nov. 17. Information and form posted below. Help Support Ohio Art League member artist Amy Neiwirth! Amy Neiwirth is a visual artist & art educator, holding a BFA in Painting & Drawing and an MA in Art Education, both from The Ohio State University. Amy is most well-known for her whimsical food-inspired jewelry she creates for her small business, Sweet Stella Designs, the 2012 winner of the “Best Brand Without A Storefront” award in the Columbus Alive’s “Best of Columbus” readers poll. Amy also creates paintings and mixed-media artwork and is a member of the Ohio Art League, CAW: Creative Arts of Women, and the Crafty Cotillion. 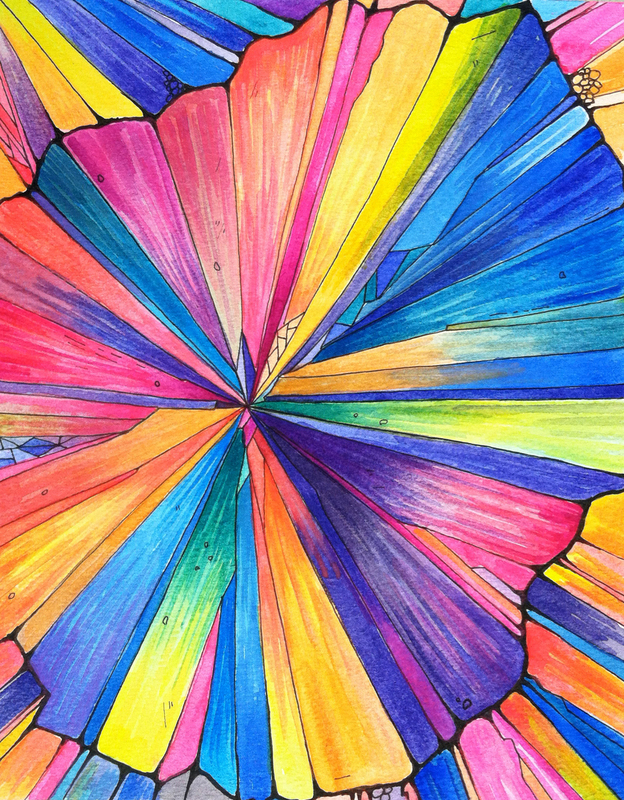 She teaches visual art for grades K-12 at a private school. Artist Amy Newirth will be exhibiting her fluorescent watercolor paintings and jewelry designs during the month of November at Image Optical in the Short North. The show, entitled “Crystallized,” is a visual departure from her other more obviously food-themed artworks. The Crystallized works explore abstractions of magnified sugar crystals and play with geometric forms and bold colors. These watercolor paintings are meticulously created from many layers of translucent paint, emphasizing color relationships and patterns. Neiwirth has created a line of jewelry to complement her Crystallized paintings. Using metal, paper, and epoxy resin, she has created wearable art at an affordable price point. Location- Image Optical is located at 607 North High Street in the Short North. New Classes Starting At Clayspace! New classes at Clayspace will be starting on October 21st! Registration for an 8 week class is only $280 per person! Evening classes meet from 6:30- 9:00 pm once a week for 8 weeks. Classes are small, ensuring students a high level of individual attention. 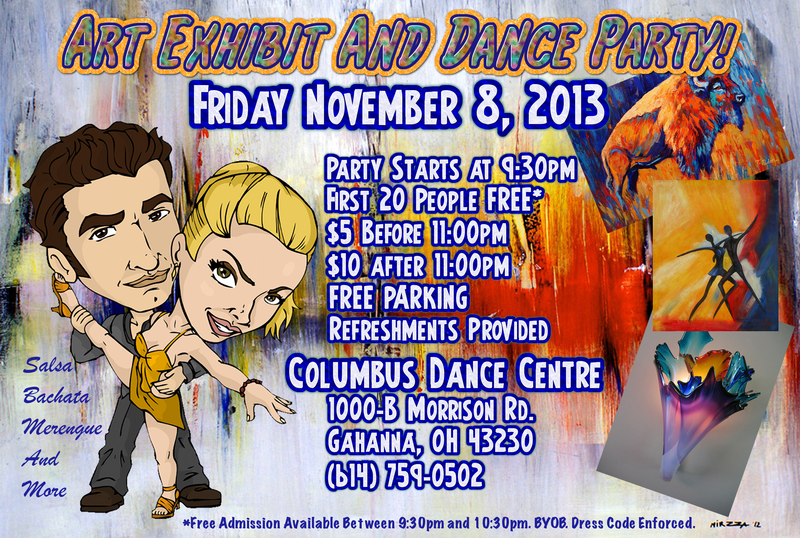 Art Exhibit and Salsa Dancing Night at Columbus Dance Centre in Gahanna. Opportunity to display your work and potentially sell some pieces!!! ANY AND ALL Artistic talent! Ohio Art League member artist Judy Takacs’s work “Loss and Acceptance” will be featured in the ‘BAYarts 51st Annual Juried Show’ starting this Friday, October 11th-November 2nd. Now in its 51st prestigious year, BAYarts Annual Juried Show attracts artists from across northern Ohio. We seek the most experienced, impartial and fair judges from varying cultural and educational venues. ROY G BIV Gallery for Emerging Artists is looking for submissions for ImageOHIO 14, a statewide, juried exhibition of the best photography, video and digital art in Ohio. Jurors Shannon Benine (Columbus College of Art & Design) and Aspen Mays (The Ohio State University) will select the exhibiting artists. Entries are limited to artists living in, or from, Ohio. The selected artists’ work will be exhibited at the Fort Hayes Shot Tower Gallery from January 21 – February 21, 2014. Member Curated Exhibition of October is ‘Tendrils, A Delicate Twist’ by member artists Nicki Strouss, Esther Hall, and Megan A, Coyan. Curated by Catherine Bell Smith this exhibition shows each woman, working in her own tradition of paper, embroidery or textile design, creates fiber art that stretches beyond the boundaries of surface design and utility. Material and technique, though not ignored, are eclipsed by message, story, and meaning. This common thread is the foundation for Tendrils, a Delicate Twist. Coyan’s appliqué and woven pieces, rich with life’s designs, and Halls storytelling embroidery work play an intricate counterpoint to Strouss’ evocative ceramic, felt, and paper vessels.